Jabo Ibehre netted a brace as MK Dons came from behind to knock out Dagenham & Redbridge and book their Carling Cup second round place. Damien McCrory put the visitors before half-time, firing home with a sublime 25-yard free-kick. But after the break Ibehre slotted the ball under keeper Tony Roberts after latching onto Jermaine Easter's pass. And he secured the Dons' win after latching on to Scott Doe's poor back pass to beat Roberts for a second time. "For the first time I had to have a go at people at half-time. "Everything's been quite smooth up until now but I had to open up a little bit and had a go at certain people and asked them to raise their game. "I said to them before they went out, 'if you don't raise your game you come off', it's as simple as that." 93:47 The referee gets the match started. 90:00+3:09 Attacking throw-in by Abu Ogogo (Dag & Red). 90:00+2:52 Attacking throw-in by Adam Chicksen (Milton Keynes Dons). 90:00+2:07 Defending throw-in by Mark Arber (Dag & Red). 90:00+0:52 Foul by Angelo Balanta (Milton Keynes Dons) on Abu Ogogo (Dag & Red). Direct free kick taken right-footed by Tony Roberts (Dag & Red) from own half, resulting in open play. 89:29 Foul by Luke Chadwick (Milton Keynes Dons) on Peter Gain (Dag & Red). Free kick taken left-footed by Damien McCrory (Dag & Red) from right channel (20 yards), over the bar. 88:49 Attacking throw-in by Angelo Balanta (Milton Keynes Dons). 88:07 Jermaine Easter (Milton Keynes Dons) caught offside. Direct free kick taken left-footed by Mark Arber (Dag & Red) from own half, resulting in open play. 87:34 Foul by Sam Baldock (Milton Keynes Dons) on Peter Gain (Dag & Red). Direct free kick taken left-footed by Mark Arber (Dag & Red) from own half, resulting in open play. 87:02 Defending throw-in by Damien McCrory (Dag & Red). 86:48 Attacking throw-in by Mark Carrington (Milton Keynes Dons). 85:51 Attacking throw-in by Adam Chicksen (Milton Keynes Dons). 84:28 Defending throw-in by Adam Chicksen (Milton Keynes Dons). 83:50 Goal kick taken long by Tony Roberts (Dag & Red). 83:29 Shot by Sam Baldock (Milton Keynes Dons) right-footed from right channel (20 yards), missed left. 82:39 Attacking throw-in by Mark Carrington (Milton Keynes Dons). 81:52 Attacking throw-in by Damien McCrory (Dag & Red). 81:10 Attacking throw-in by Jon Nurse (Dag & Red). 80:18 Attacking throw-in by Damien McCrory (Dag & Red). 80:05 Defending throw-in by Damien McCrory (Dag & Red). 78:09 GOAL - Jabo Ibehre:MK Dons 2 - 1 Dag & Red Goal by Jabo Ibehre (Milton Keynes Dons) right-footed (top-left of goal) from right side of penalty area (12 yards).Milton Keynes Dons 2-1 Dag & Red. 77:50 Jermaine Easter (Milton Keynes Dons) caught offside. Direct free kick taken right-footed by Tony Roberts (Dag & Red) from own half, resulting in open play. 76:41 Jabo Ibehre (Milton Keynes Dons) caught offside. Direct free kick taken right-footed by Tony Roberts (Dag & Red) from own half, resulting in open play. 75:05 Substitution Milton Keynes Dons substitution: Luke Howell replaced by Sam Baldock (tactical). 74:34 Attacking throw-in by Jon Nurse (Dag & Red). 73:56 Foul by Peter Leven (Milton Keynes Dons) on Peter Gain (Dag & Red). Free kick crossed left-footed by Damien McCrory (Dag & Red) from left channel, clearance by Dean Lewington (Milton Keynes Dons). 73:31 Attacking throw-in by Luke Howell (Milton Keynes Dons). 73:20 Attacking throw-in by Luke Howell (Milton Keynes Dons). 70:57 Inswinging corner from right by-line taken left-footed by Peter Leven (Milton Keynes Dons) to centre, clearance by Scott Doe (Dag & Red). 70:32 Substitution Dag & Red substitution: Darren Currie replaced by Peter Gain (tactical). 70:00 Substitution Dag & Red substitution: Paul Benson replaced by Phil Walsh (tactical). 69:29 Substitution Dag & Red substitution: Josh Scott replaced by Damian Scannell (tactical). 69:01 Shot by Peter Leven (Milton Keynes Dons) left-footed from left channel (18 yards), over the bar. 68:47 Cross by Luke Chadwick (Milton Keynes Dons), save (punched) by Tony Roberts (Dag & Red). 68:16 Goal kick taken long by Tony Roberts (Dag & Red). 68:02 Cross by Adam Chicksen (Milton Keynes Dons), resulting in ball out of play. 67:22 Cross by Adam Chicksen (Milton Keynes Dons), clearance by Mark Arber (Dag & Red). 66:51 Attacking throw-in by Adam Chicksen (Milton Keynes Dons). 66:35 Defending throw-in by Jon Nurse (Dag & Red). 66:04 Josh Scott (Dag & Red) caught offside. Direct free kick taken left-footed by Dean Lewington (Milton Keynes Dons) from own half, passed. 65:30 Defending throw-in by Abu Ogogo (Dag & Red). 64:19 Defending throw-in by Adam Chicksen (Milton Keynes Dons). 63:55 Jabo Ibehre (Milton Keynes Dons) caught offside. Direct free kick taken left-footed by Mark Arber (Dag & Red) from own half, resulting in open play. 63:36 Cross by Jermaine Easter (Milton Keynes Dons), clearance by Scott Doe (Dag & Red). 62:20 Foul by Luke Howell (Milton Keynes Dons) on Jon Nurse (Dag & Red). Free kick crossed right-footed by Darren Currie (Dag & Red) from right wing, resulting in open play. 61:42 Inswinging corner from left by-line taken right-footed by Darren Currie (Dag & Red) to far post, clearance by Dean Lewington (Milton Keynes Dons). 60:54 Foul by Luke Howell (Milton Keynes Dons) on Damien McCrory (Dag & Red). Direct free kick taken right-footed by Tony Roberts (Dag & Red) from own half, resulting in open play. 60:24 Attacking throw-in by Luke Howell (Milton Keynes Dons). 59:48 Foul by Mark Arber (Dag & Red) on Jermaine Easter (Milton Keynes Dons). Direct free kick taken left-footed by Peter Leven (Milton Keynes Dons) from right channel, passed. 59:21 Attacking throw-in by Adam Chicksen (Milton Keynes Dons). 59:09 Cross by Angelo Balanta (Milton Keynes Dons), clearance by Mark Arber (Dag & Red). 58:30 Cross by Adam Chicksen (Milton Keynes Dons), save (caught) by Tony Roberts (Dag & Red). 56:39 Outswinging corner from right by-line taken right-footed by Darren Currie (Dag & Red) to centre, clearance by Dean Lewington (Milton Keynes Dons). 55:20 Assist (pass) by Jermaine Easter (Milton Keynes Dons) from left channel. 55:20 GOAL - Jabo Ibehre:MK Dons 1 - 1 Dag & Red Goal by Jabo Ibehre (Milton Keynes Dons) right-footed (bottom-left of goal) from right side of penalty area (18 yards).Milton Keynes Dons 1-1 Dag & Red. 54:45 Defending throw-in by Jon Nurse (Dag & Red). 54:21 Attacking throw-in by Adam Chicksen (Milton Keynes Dons). 53:53 Defending throw-in by Jon Nurse (Dag & Red). 53:20 Substitution Milton Keynes Dons substitution: Lewis Guy replaced by Luke Chadwick (injury). 51:49 Attacking throw-in by Luke Howell (Milton Keynes Dons). 51:34 Attacking throw-in by Luke Howell (Milton Keynes Dons). 50:52 Jermaine Easter (Milton Keynes Dons) caught offside. Direct free kick taken right-footed by Tony Roberts (Dag & Red) from own half, resulting in open play. 49:44 Defending throw-in by Adam Chicksen (Milton Keynes Dons). 49:08 Goal kick taken long by Tony Roberts (Dag & Red). 48:29 Inswinging corner from right by-line taken left-footed by Peter Leven (Milton Keynes Dons) to centre, header by Dean Lewington (Milton Keynes Dons) from centre of penalty area (6 yards), missed right. 48:15 Attacking throw-in by Luke Howell (Milton Keynes Dons). 47:57 Defending throw-in by Damien McCrory (Dag & Red). 47:07 Attacking throw-in by Angelo Balanta (Milton Keynes Dons). 46:38 Inswinging corner from right by-line taken left-footed by Peter Leven (Milton Keynes Dons) to centre, clearance by Scott Doe (Dag & Red). 46:11 Foul by Paul Benson (Dag & Red) on Dean Lewington (Milton Keynes Dons). Direct free kick taken left-footed by Dean Lewington (Milton Keynes Dons) from own half, passed. 45:29 Lewis Guy (Milton Keynes Dons) caught offside. Direct free kick taken right-footed by Tony Roberts (Dag & Red) from own half, resulting in open play. 45:00+1:17 Attacking throw-in by Darren Currie (Dag & Red). 45:00+1:00 Attacking throw-in by Damien McCrory (Dag & Red). 45:00+0:03 Attacking throw-in by Luke Howell (Milton Keynes Dons). 43:36 Defending throw-in by Damien McCrory (Dag & Red). 43:14 Defending throw-in by Adam Chicksen (Milton Keynes Dons). 42:44 Jabo Ibehre (Milton Keynes Dons) caught offside. Direct free kick taken right-footed by Tony Roberts (Dag & Red) from own half, resulting in open play. 41:38 Defending throw-in by Jon Nurse (Dag & Red). 39:58 Attacking throw-in by Luke Howell (Milton Keynes Dons). 39:34 Attacking throw-in by Adam Chicksen (Milton Keynes Dons). 38:57 Cross by Angelo Balanta (Milton Keynes Dons), header by Jabo Ibehre (Milton Keynes Dons) from centre of penalty area (12 yards), save (caught) by Tony Roberts (Dag & Red). 38:19 Inswinging corner from right by-line taken left-footed by Peter Leven (Milton Keynes Dons) to centre, clearance by Mark Arber (Dag & Red). 37:17 Attacking throw-in by Adam Chicksen (Milton Keynes Dons). 36:48 Attacking throw-in by Adam Chicksen (Milton Keynes Dons). 36:35 Defending throw-in by Abu Ogogo (Dag & Red). 36:17 Foul by Josh Scott (Dag & Red) on Dan Woodards (Milton Keynes Dons). Direct free kick taken right-footed by David Martin (Milton Keynes Dons) from own half, resulting in open play. 35:55 Attacking throw-in by Jon Nurse (Dag & Red). 34:47 Foul by Mark Arber (Dag & Red) on Jabo Ibehre (Milton Keynes Dons). Direct free kick taken right-footed by Peter Leven (Milton Keynes Dons) from right wing, passed. 33:01 Attacking throw-in by Peter Leven (Milton Keynes Dons). 32:21 Cross by Lewis Guy (Milton Keynes Dons), blocked by Damien McCrory (Dag & Red). Inswinging corner from right by-line taken left-footed by Peter Leven (Milton Keynes Dons) to centre, clearance by Mark Arber (Dag & Red). 31:53 Defending throw-in by Adam Chicksen (Milton Keynes Dons). Correction - 29:49 Substitution Milton Keynes Dons substitution: Pedro Pele replaced by Adam Chicksen (injury). 29:49 Substitution Adam Chicksen on for Pedro Pele. 29:49 Lewis Guy (Milton Keynes Dons) caught offside. Direct free kick taken right-footed by Tony Roberts (Dag & Red) from own half, resulting in open play. 28:57 Attacking throw-in by Jon Nurse (Dag & Red). 28:34 Attacking throw-in by Jabo Ibehre (Milton Keynes Dons). 25:56 Defending throw-in by Damien McCrory (Dag & Red). 25:09 Defending throw-in by Abu Ogogo (Dag & Red). 24:46 Attacking throw-in by Dean Lewington (Milton Keynes Dons). 24:10 Defending throw-in by Jon Nurse (Dag & Red). 23:18 Foul by Paul Benson (Dag & Red) on Dean Lewington (Milton Keynes Dons). Direct free kick taken right-footed by David Martin (Milton Keynes Dons) from own half, resulting in open play. 21:56 Inswinging corner from left by-line taken right-footed by Angelo Balanta (Milton Keynes Dons) to centre, clearance by Mark Arber (Dag & Red). 20:54 Defending throw-in by Dean Lewington (Milton Keynes Dons). 20:12 Attacking throw-in by Abu Ogogo (Dag & Red). 18:45 Inswinging corner from right by-line taken left-footed by Peter Leven (Milton Keynes Dons) to centre, clearance by Mark Arber (Dag & Red). 18:25 Cross by Lewis Guy (Milton Keynes Dons), blocked by Damien McCrory (Dag & Red). 17:53 Goal kick taken long by Tony Roberts (Dag & Red). 17:15 Cross by Angelo Balanta (Milton Keynes Dons), shot by Jabo Ibehre (Milton Keynes Dons) left-footed from centre of penalty area (6 yards), missed right. 15:33 Cross by Angelo Balanta (Milton Keynes Dons), clearance by Mark Arber (Dag & Red). 14:47 Defending throw-in by Dean Lewington (Milton Keynes Dons). 14:36 Defending throw-in by Abu Ogogo (Dag & Red). 14:21 Defending throw-in by Jon Nurse (Dag & Red). 13:18 Cross by Jon Nurse (Dag & Red), clearance by Dan Woodards (Milton Keynes Dons). 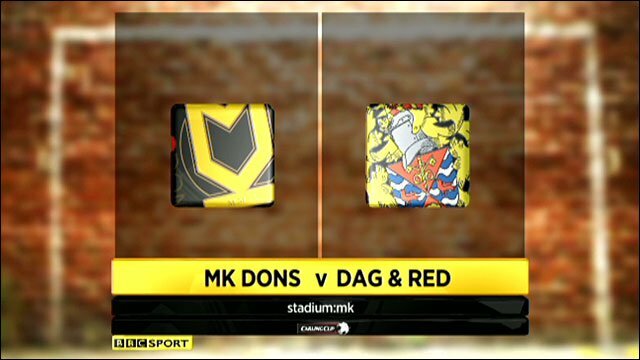 11:10 GOAL - Damien McCrory:MK Dons 0 - 1 Dag & Red Free kick scored by Damien McCrory (Dag & Red) left-footed (top-right of goal) from right channel (20 yards).Milton Keynes Dons 0-1 Dag & Red. 11:10 Foul by Peter Leven (Milton Keynes Dons) on Jon Nurse (Dag & Red). 10:21 Attacking throw-in by Luke Howell (Milton Keynes Dons). 9:47 Defending throw-in by Dean Lewington (Milton Keynes Dons). 7:35 Inswinging corner from left by-line taken right-footed by Darren Currie (Dag & Red) to far post, clearance by Dan Woodards (Milton Keynes Dons). 6:14 Foul by Jon Nurse (Dag & Red) on Dean Lewington (Milton Keynes Dons). Direct free kick taken right-footed by David Martin (Milton Keynes Dons) from own half, passed. 5:36 Attacking throw-in by Jon Nurse (Dag & Red). 5:09 Jabo Ibehre (Milton Keynes Dons) caught offside. Direct free kick taken right-footed by Tony Roberts (Dag & Red) from own half, resulting in open play. 4:00 Defending throw-in by Dean Lewington (Milton Keynes Dons). 3:16 Defending throw-in by Jon Nurse (Dag & Red). 2:48 Attacking throw-in by Dean Lewington (Milton Keynes Dons). 2:10 Attacking throw-in by Luke Howell (Milton Keynes Dons). 1:47 Defending throw-in by Luke Howell (Milton Keynes Dons). 0:52 Foul by Stuart Lewis (Dag & Red) on Jermaine Easter (Milton Keynes Dons). Direct free kick taken right-footed by Peter Leven (Milton Keynes Dons) from right channel, passed. The referee blows his whistle to start the second half.